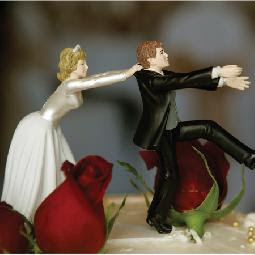 Humorous cake topper with bride grabbing the groom. It has been a very busy weekend and I've been VERY tired! I didn't have the chance to update my blog and to visit my blogging friends. Phew~ So many things to catch up with. Well, we attended my friend's wedding, a fabulous wedding during the weekend! We receive the extra special wedding invitations with their favorite picture printed on high quality board with a soft translucent overlay which holds their personalized invitation, six weeks ago. "What will I wear?" is the eternal question of me, and doubly so when invited to a wedding. I felt like I had a closet full of dresses, but nothing to wear to my friend's wedding. And so six weeks has passed. Gosh! Time has passed by so fast and I was still thinking the same question, LOL! The dinner was at 7.00pm. But my friend would love to see me at their romantic heavenly decorated Bridal Suite, before the dinner starts. I have just woken up from a nap because I had to get out of my bed early that day. I quickly rushed to the salon and get my hair washed. And then quickly rushed home to change and put on make-up. Still, a little late I suppose because my friend the bride who was of course simply glowing was already at the reception area. I ran over and hugged her. As we hugged she rambled about how glad she was to *finally* see me! Oh, I have yet to receive our photos taken by their wedding photographers. 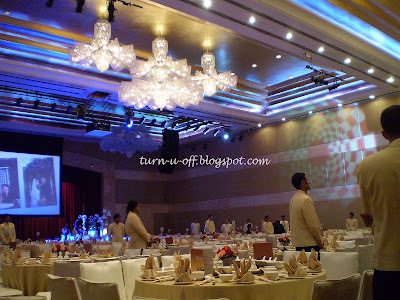 The grand ballroom offers great moods and matchless settings. The romance, the elegance, the precision of everything! You see every girl dreams of a fairytale ballroom wedding with hundreds of guests and extravagant entrees. The reality, an extravagant fairytale wedding comes at a price. So how much are you willing to pay to achieve the ideal wedding? Well, a wedding can still achieve a fairytale atmosphere but at a lesser amount. There are dozens if not hundreds of creative ways to save money on your wedding ceremony, such as get frugal with your flowers, cheap wedding invitations that look like it cost a fortune and these ideas will get you started on the road to planning a wedding that's both beautiful and affordable. For bride on a budget, be "wise" and check Bride and Groom Direct out! Also, their special promotions page for all sorts of discounts! 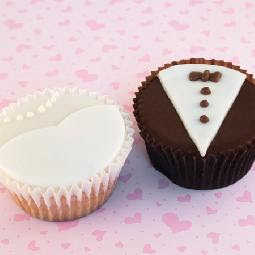 Contemporary cup cakes with tuxedo and wedding dress icing. I was playing game lol! oh u're playing game! I'm working on another new post now lol :-P come chop later! I hope u had a wonderful time! 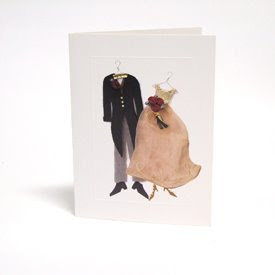 Yeah so cute and suitable as gift…I love la weddings! Ouh...so these few days you are busy attending wedding? ha :D Yeah! It must be a very happy occasion huh! So when is your turn?